Hydropower Market size for 2016 was over 1,000 GW of cumulative installation and is set to witness gain over 2% by 2024. Growing focus toward adoption of renewable energy integration coupled with its wide applications range including water supply for irrigation and flood control will propel the hydropower market growth. Volatile fossil fuel prices along with measures towards energy security will further complement the industry landscape. As per World Energy Council, electricity generated through hydropower accounted for 71% of the global sustainable energy in 2015. Low levelized cost, high capacity utilization factor and ease of grid parity are some of the key parameters which will stimulate global hydropower market size. In April 2017, Energy Information Administration (EIA) analyzed hydroelectricity capacity utilization factor (CUF) to be over 60% when compared to 25% for Solar PV. Stringent government norms towards greenhouse gas emissions coupled with depleting conventional resources will stimulate the business landscape. In December 2015, Canada West Foundation and United Nations Framework Convention on Climate Change (UNFCCC) signed an agreement to reduce the GHG emissions. Increasing demand for reliable and continuous electricity along with rising measures to reduce carbon footprints will stimulate global hydropower market. In March 2016, U.S. government extended tax credit for renewable energy including hydropower and hydrokinetic, which will further complement the business outlook. In October 2014, the Federal Government invested over USD 3.5 million to support hydroelectric production under Section 242 of the Energy Policy Act. Low civil construction cost coupled with growing measures to limit the emissions will foster small hydropower market size. In 2015, the Economic Community of West African States (ECOWAS) introduced the Small-Scale Hydro Power (SSHP) Program with a target of achieving 33% share of the overall energy mix by 2020 under the ECOWAS Renewable Energy Policy (EREP). Favorable renewable policy model along with financial assistance by institutions including Climate Aligned Bonds Initiative, World bank and Aquila Capital will drive the large hydropower market. Abundant availability with growing electricity demand from countries including Brazil, India and China will further complement the industry outlook. In 2015, USD 41.8 billion of labelled green bonds were allotted by the Climate Aligned Bonds Initiative with an aim to increase the global hydroelectric share up to 13%. Mini accounted for 2% of global hydropower market share in 2016. Cost competitiveness and low environment impact are some of the advantages which make its adoption preferable over other available alternatives. Growing demand for off grid electricity along with establishment and upgradation of electric infrastructure will further stimulate the product landscape. In September 2016, Government of Malaysia introduced the Sarawak Alternative Renewable Energy Scheme which incorporates community solar or micro hydro power plant for rural electrification in the region. U.S. hydropower market in 2016 accounted for over 50% of the North America share. Abundant availability of untapped reserves with growing measures towards clean and reliable electricity is anticipated to drive the industry growth. Growing investment towards sustainable energy may further complement industry landscape. In 2015, Rey Development announced an investment of USD 60 million towards hydroelectric installations across the country. For Europe, France hydropower market size is set to exceed 30 GW of cumulative capacity by 2024. Rising concern towards climate change along with strict government regulations to reduce carbon emission will stimulate the industry size. EU Renewable Directive (2009/28/EC) requires all the member states to meet a binding target of 20 percent final energy consumption from renewable sources by 2020. In 2014, electricity generation from hydropower accounted for 13.2% of the total electricity produced. Growing electricity demand along with measures to curb carbon footprint will drive China hydropower market. Rapid industrialization and urbanization are some of the factors encouraging the industry growth. China plans to invest USD 3.6 billion in Myanmar’s Myistone facility to generate 6,000 MW of hydroelectricity power by 2030. The Government of China, in its 13th Five Year Plan, announced strategic plans to pursue clean energy goals including a proposed installation target of 340 GW of hydroelectric stations by 2020. 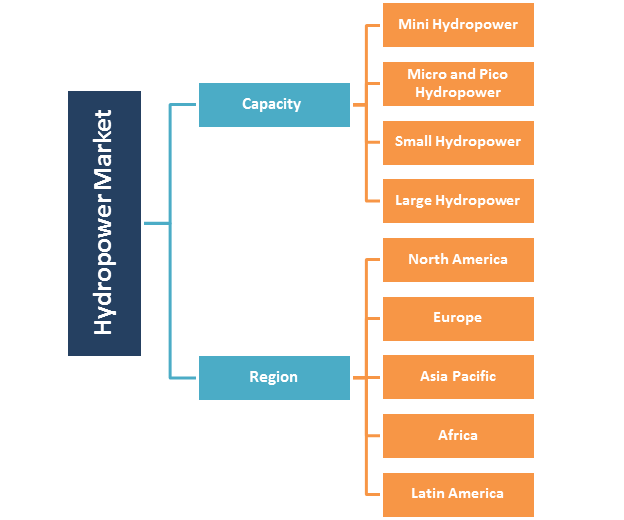 Key players in hydropower market include Voith, ANDRITZ HYDRO, General Electric, China Three Gorges Corporation, Alfa Laval, Metso, China Yangtze Power, Hydro-Québec, RusHydro, Agder Energi, Duke Energy, Georgia Power, Ontario Power Generation, StatKraft, ABB, Engie, Tata Power, EDF. Notable industry players, under their strategic vision, are opting for mergers and acquisitions to expand their market share across the globe. In February 2013, Voith acquired Vortex Hydrosystemes Inc. to establish a manufacturing facility in Quebec with the objective of specialized consulting services, hydropower products and auxiliary mechanical systems. Electricity generated by converting kinetic energy of flowing water into electric current is defined as hydroelectric power. Reliability, high power output, long operating life and low maintenance & operation cost are some of the salient features which will drive the hydropower market. Storage schemes offer benefits to irrigation, flood control, navigation, drinking water supply, aquaculture and tourism, recreation, and opening avenues for remote areas. Hydroelectric plant has socio-economic benefits including safe, affordable and continuous electricity for end users.